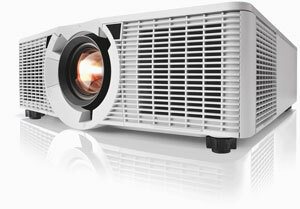 Christie has announced the H Series: two 1DLP projectors that boast 12,000 lumens and weigh in at just 52.5 pounds. Designed for large auditoriums, the dual-lamp Christie D12HD-H and Christie D12WU-H are about half the size of other devices in their class, according to the company. The Christie H Series will be available in April with a three-year parts and labor warranty. For more information, visit the Christie site.